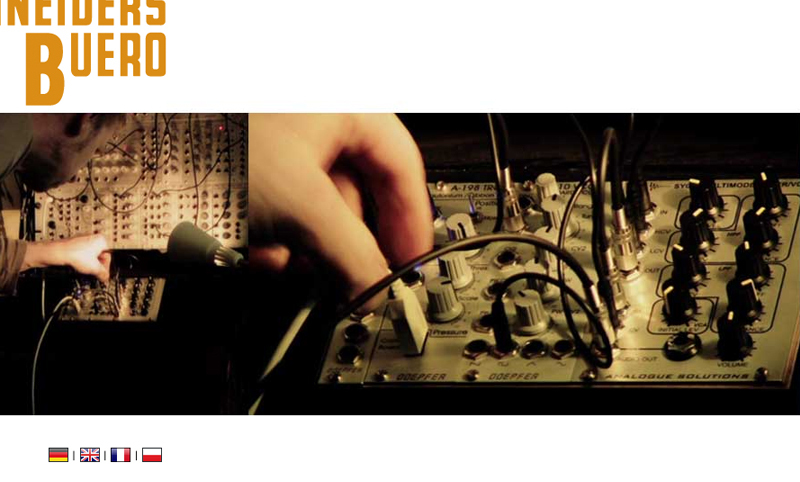 I’ll be holding a workshop and playing live at Sonar Traffic’s Modulation in Utrecht next week, Wednesday September 14th. It’s an off-event for the International Computer Music Conference, ICMC. The builder of marvellous mechanical modules, Gijs Gieskes and the prolific performer and composer Richard Scott will also play. My workshop starts at 19:30 and the concerts begin an hour later. The Facebook Event and ticket information is here. 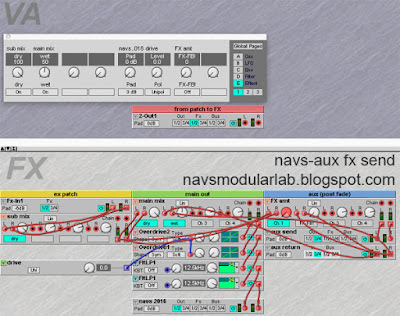 For my workshop I want to look into what makes music modular. 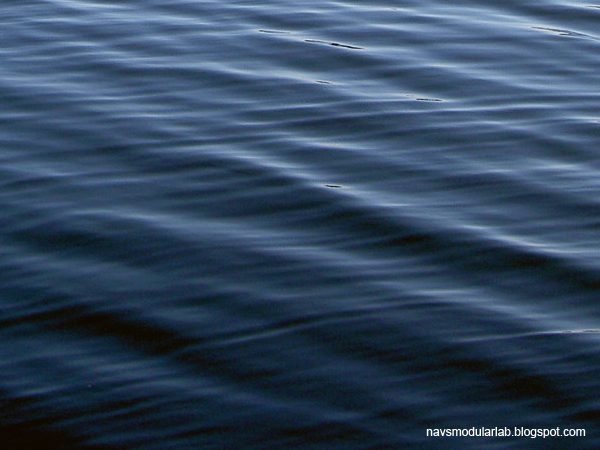 Is it the sound, the organisation of sound or is it just about the gear? We’ll look at function blocks, feedback and performance patches. Look forward to seeing you in Utrecht next Wednesday! Thanks to Synthtopia for taking the time to document our trio's concert at Superbooth! Hilary Jeffery has dates in France this weekend. Check his site for more live engagements. 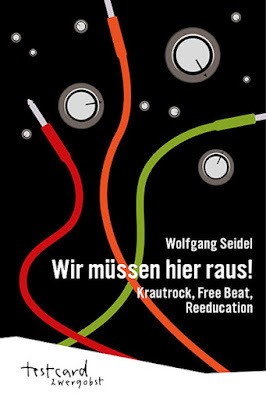 Wolfgang Seidel has just published a book about Krautrock. Everything you ever wanted to know about this strange German music but were afraid to ask, written by a man who was there. 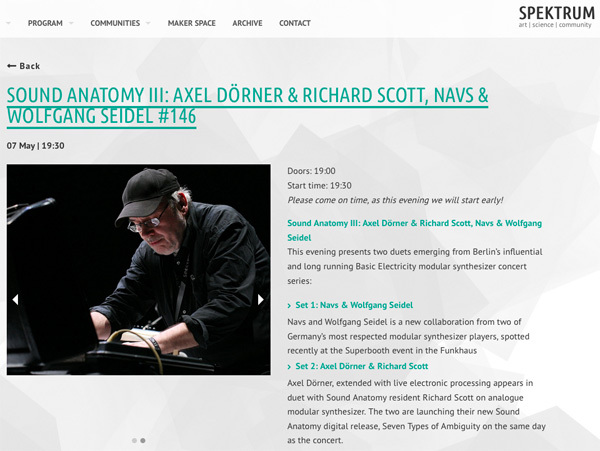 Fresh from our Superbooth set, I’m looking forward to another chance to improvise with Wolfgang Seidel. We are playing at Spektrum in Berlin, Neukölln next Saturday, May 7. Doors open at 19:00 and we must start by 20:00 so don’t be late! Also on the bill at Richard Scott’s Sound Anatomy night will be the pipe-smoking professor himself in duet with trumpet-player extraordinaire Axel Dörner. They will launch their new release on the Sound Anatomy label. Spektrum is at Bürknerstr. 12 in 12047 Berlin Neukölln. The Facebook Event is here. 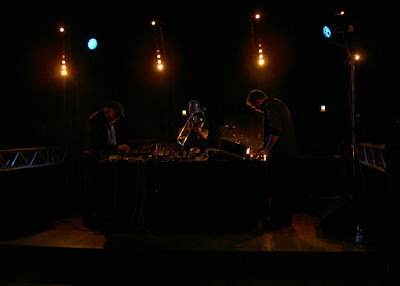 Playing live electronics can be a lot of fun, especially given a nice sound system and large room. The one bane for the performer can be the amount of equipment he or she needs and, conversely, the amount of space offered by the venue. A case or two of modules, a small mixer and a couple of effects often have to be unpacked, set-up and dismantled on a small table in a short amount of time. Frank Bretschneider’s minimal kit list for his Superbooth performance was inspiring: just an Elektron Octatrack and an external delay. Frank told me the effects box was wired as an auxiliary loop within the Octatrack. I’m not familiar with the architecture of the Elektron but saw a possible parallel with the Clavia Nord Modular G2 system. Above is the FX framework that I’ll be using at the Spektrum gig. It means I don’t have to bring an external mixer and can control levels directly from the G2. A multiple of outputs 1+2 is sent to an external effects unit via physical outputs 3+4 and returned via Ins 3+4. I’ve set the modulation wheel to act as the FX send pot and dedicated one knob page to the virtual mixer. With a few tweaks it could easily be modified for ‘voltage controlled’ automation. It’s not perfect as there is a momentary muting of the output when switching between patches. 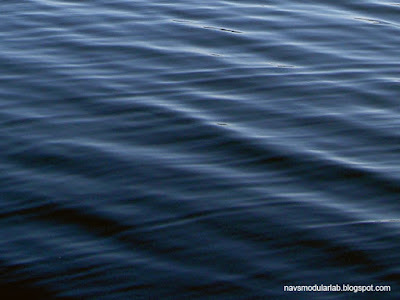 But I felt it was more important to have control over the main as well as dry/wet levels and ratios. This is especially important when, for example, using my gigging delay, the EHX SMMH, as a looper. Patching the delay physically between the synth and the venue’s PA/ mixer would not be as flexible. There seems to be a drop in levels between the VA + FX sections on the G2, irrespective of any padding. To avoid overdriving the delay pedal I have additionally padded the input to the FX section by -6dB. You can switch in a 6dB boost or add some overdrive to make up the gain should you need it. Be careful of avalanches if you use the FX-FB feedback loop. You can download the G2 patch here. Let me know how you get on. Hope to see you at the gig! 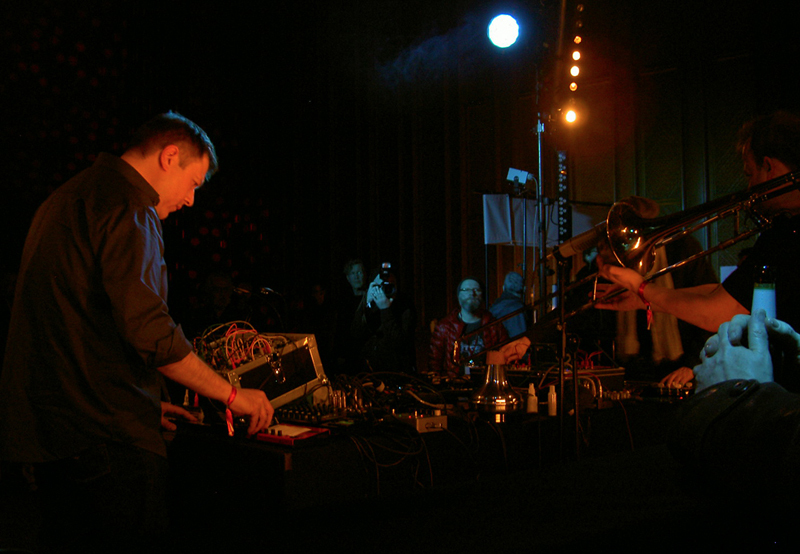 Thanks to everyone who came to see the concerts in Saal 2 of the Funkhaus on Friday night of Superbooth. Wolfgang Seidel, Hillary Jeffery, Hainbach, Frank Bretschneider and I had a great time. Thanks also to Andreas Schneider and especially Adam and his team for the wonderful sound and light. Our trio’s set was improvised but Wolfgang and I did have one ‘get to know you’ musical session, during which I noticed he uses not one but three Doepfer R2M ribbon controllers! I had tried one of these years ago, when Schneider bundled them together with an Analogue Solutions MS-20 filter/ VCA and Doepfer VCO - the Jimi-Box, named for Hendrix. But the ‘widdle’ wore thin pretty quick so I passed on the analogue version of the ribbon controller. The R2M, of course, can ‘speak’ both analogue and digital. It’s a good partner for the MIDI-equipped Clavia Micromodular, which has only three knobs and no keyboard. For its part, the Micromodular, with its familiar environment and patch recall, is the perfect accompaniment to an analogue modular when playing live. You can see me using them in the second picture above. Here are two patches from that concert. One is inspired by Peter Grenader’s iconic ribbon video from a few years ago. Note position determines pitch, panning and also speed of the clocking VC-LFO, pressure adds modulation. I wanted to use a voltage controlled radio during our set at the Funkhaus, the former East German broadcasting house, but was unsure of whether I’d get any reception. The answer was to mimic the random bursts of noise and music fragments with this second patch. Three comparators provide an on-off switch for the virtual radio, tonal and frequency changes. You can download the patches and R2M preset info here. Let me know how you get on! I’m very happy to present an evening of improvised music on Friday, 1st April at Andreas Schneider’s inaugural Superbooth in Berlin’s historic Funkhaus. Basic Electricity stalwart, Wolfgang Seidel and I will be joined by Hilary Jeffery on trombone for a clangorous electro-acoustic trio. Hainbach combines recordings and melodic modular electronics and is accompanied by Orca’s hand drawn and animated visuals. And Frank Bretschneider presents his new project Sinn + Form, featuring recordings of vintage Buchla & Serge systems at EMS, Stockholm. Follow the links in the artist’s names for more information and media. Click this link for a list of evening events. We’ll play in the wonderful Saal 2, the so-called ‘small’ recording hall! Click here for more pictures and information about the Funkhaus. Look forward to seeing you at Superbooth! The latest issue of the Canadian Electroacoustic Community’s online journal is called “Analogue and Modular Synthesis: Resurgence and Evolution”. It’s about the renewed interest in modulars and how we use them live and in composition. The magazine features 20 articles on the basics, practicalities and philosophies surrounding these instruments by authors including Rob Hordijk, Peter Blasser and myself. Many thanks to Richard Scott, jef chippewa and colleagues for their hard work in making this happen. Enjoy the read and let us know what you think!